Ramsay Hunt Syndrome is a painful facial syndrome that occurs when the virus that causes chicken pox affects the nerve around your ear. It was first described in 1907 by James Ramsay Hunt who had a patient who had ear pain and a rash around the ear. The disease is called Herpes Zoster and the nerve involved is the geniculate ganglion. The causative agent is the Varicella Zoster virus which causes chicken pox. The virus causes chicken pox at an early age and then lays dormant in the nerves until it is reactivated at a later time. The virus causes a painful rash around the ear and may also cause facial paralysis. Approximately 20% of patients with Bell’s Palsy may be due to Ramsay Hunt syndrome. You may also develop ringing in the ears, dizziness, vertigo and alterations in taste. 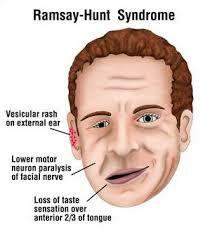 Ramsay Hunt syndrome can develop at any age but is usually a disease of older adults. Patients with impaired immune systems such as lymphoma or those patients receiving chemotherapy and radiation are particularly susceptible. The pain of Ramsay Hunt syndrome begins as a dull aching pain but may progress to a move severe burning and may precede the onset of the rash. There are several test that may be useful. Fluid from a fresh vesicle may be obtained. This is used to do a Tzanck smear, Polymerase Chain Reaction (PCR) or Direct Immunoflourescence Assay (DFA). Treatment begins with anti-virals such as acyclovir and corticosteroids. Opioids and anticonvulsants such as gabapentin and pregabalin are used for pain control. Sympathetic blocks in the area may also provide pain relief and are very useful especially if done early in the disease course. Early and aggressive treatment is the key to success with this problem.